ReseaTech GmbH is a pioneer in building electromagnetic single-use micro valves. 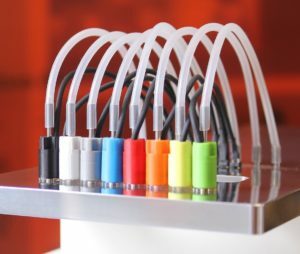 In a development project at Berne University of applied Sciences in 2010 a micro valve with unique requirements was created: the valve had to be sterile, fast and easy to manufacture and therewith be suitable for single-use applications. The B-drop mini is probably the micro valve at the most competitive pricepoint in its class today and the only one to be developed specifically for sterile applications. The B-drop micro valve has a permanent magnetic plunger with a seal, that is operated by an electromagnetic coil. Through the convenient layout of the magnetic circuit, the valve works without a spring. It can be activated electronically in both directions and is normally closed. The B-drop valve technology is suited for sterilization by gamma or x-ray radiation. In the near future a steam sterilizeable version will be possible. As the main component of time-pressure dispensers, micro valves take a central role in many dosing applications. Possible application areas are: Filling machines, application of chemicals, dosing robots, graphic printing, 3D-printing and also applications in the food and pharma industry. In all applications where costs and quality matter, the b-drop technology is in demand. For the excitation of micro valves, ReseaTech has its well proved and tested valve driver. The driver electronics can control up to 4 valves simoultaniously, with a resolution of one microsecond.